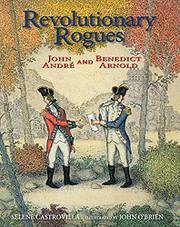 During the Revolutionary War, Maj. John André and Maj. Gen. Benedict Arnold each sought glory, but instead both found ruin. André was in charge of British secret intelligence. Arnold was the American hero of the Battle of Saratoga. But Arnold felt slighted. Maimed in the battle, capable of no further battlefield heroics, and denied official reward and recognition from Congress, he sought fame and fortune in an unusual way: plotting with André, he would hand over the American stronghold of West Point and its 3,000 soldiers to the British. This would hasten the end of the war, and Americans would be grateful. However, this was treason. André was caught and hanged, and Arnold lived in exile for the rest of his life. It’s a complicated story, and Castrovilla’s choice of telling it in alternating third-person points of view diffuses dramatic tension and pacing. Even the concluding gallows scene is kept at a distance, in both words and image. The illustrations, however, are stellar, employing O’Brien’s signature squiggly ink lines and watercolor for an effect akin to 18th-century hand-colored woodcuts. The effective alternation of framed illustrations and full-bleed spreads adds necessary drama to the tale. Overall, a volume that young history buffs will find absorbing.